A delegation of Simcoe County residents attended proceedings at the Ontario Legislature yesterday and met with MPPs to underscore the urgent need for meaningful protection for the uniquely pure water that springs from the Simcoe Uplands Moraine in Tiny Township. 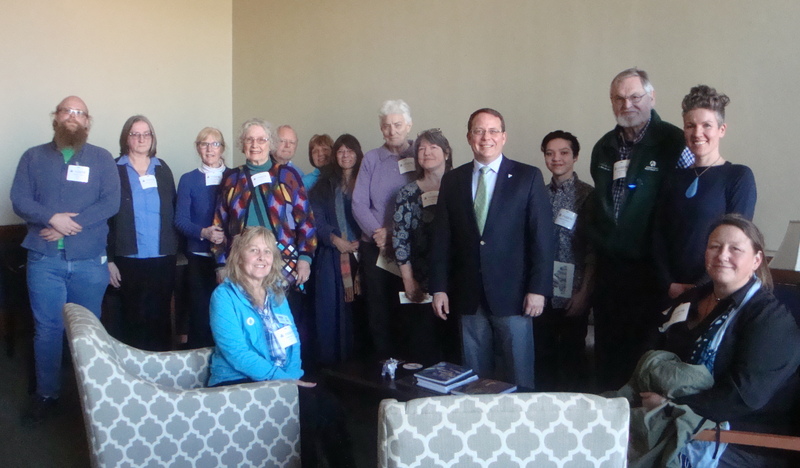 At the beginning of the afternoon session, Ontario Green Party leader Mike Schreiner (MPP for Guelph) introduced the group from Simcoe County who were seated in the visitors’ and members’ galleries. Among them were representatives of the Federation of Tiny Township Shoreline Associations, the Friends of the Waverley Uplands, Tottenham-water, the Anishinaabe Kweag, the Waterkeepers and AWARE Simcoe. In 2009, First Nations, cottagers, farmers and residents were finally successful in defeating Simcoe County’s plan for Dump Site 41. Aggregate extraction is the new threat to the water. In a meeting yesterday, Schreiner explained that on December 5, 2018 he will be bringing forward a private member’s bill to protect water within another moraine. The group will press for protection for all moraines like the Simcoe Uplands Moraine, also known as the Waverley Uplands. The delegation had a productive half-hour meeting with MPP Ian Arthur (Kingston and the Islands), the New Democratic Party’s critic for the environment and sustainability, who is working with Schreiner on his private member’s bill. They also met with Progressive Conservative Simcoe North MPP Jill Dunlop, who is gathering information on the issue. The Simcoe Uplands Moraine is attracting increasing scientific interest since tests over more than two decades by William Shotyk, now Bocock Chair for Agriculture and the Environment at the University of Alberta, have found it to be purer than 5,000-year-old Arctic ice cores. Several other water experts recently toured the area taking samples, including John Cherry, director of the University Consortium for Field-Focused Groundwater Contamination Research and an adjunct professor in the engineering department at the University of Guelph, and Ian Clark, Director of Geochemistry and Isotope Laboratories in the Faculty of Science Earth Sciences at the University of Ottawa. It was an honour to spend the day with other dedicated Water Warriors. The energy and dedication shared truly filled our souls with the spirit necessary to continue to fight for the water. It’s common sense to anyone who has any. Water has to be protected. As with everywhere I go, I bring with me the strength of Cheryl Anne Schmidt, my partner in our fight for clean water in Tottenham. Same Aquifer, but the southern end of it.